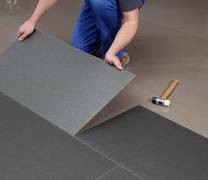 Here you will find general installation instructions for multilayer modular floor coverings. Floor covering as described in EN 16511:2014, as well as other semi-rigid multilayer modular floor coverings for floating Installation. Note: The provisions and figures on this website and in the technical bulletin TB2 refer to the installation of multilayer modular floor coverings to be laid floating. The provisions and figures on this website and in the technical bulletin do not in any way lay claim to completeness. They reflect as far as reasonably possible the current state of the art. They are meant to serve as nonbinding guidelines in conjunction with the installation instructions which apply specifically to the product in question. Warranty claims cannot be derived from the provisions of this text. If any doubt exists as to any of the provisions contained herein, the manufacturer/supplier of the respective MMF product should be consulted.